What is a good strategy for scalping forex? There are different strategies to be found when it comes to scalping. Often different indicators are used with scalping. but I have described a way in which you can use indicators (which I do not like at all) to scalp. Just for the sake of clarity this is not the way we the forex scalpers work/scalp! How to start scalping forex strategy? 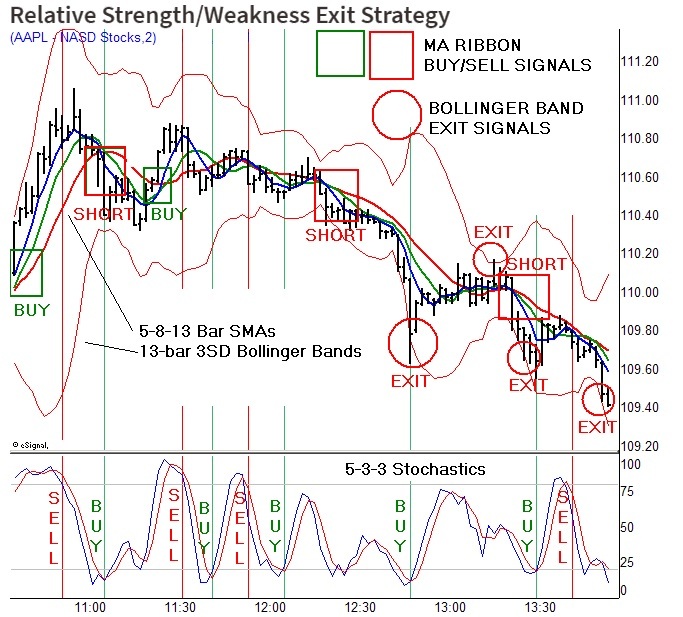 -Place a 5-8-13 SMA combination on the two-minute chart to identify strong trends that can be bought or sold short on counterswings, as well as to get a warning of impending trend changes that are inevitable in a typical market day. This scalp trading strategy is easy. -The 5-8-13 ribbon will align, pointing higher or lower, during strong trends that keep prices glued to the 5 or 8-bar SMA. Penetrations into the 13-bar SMA signal waning momentum that favors a range or reversal. -The ribbon flattens out during these range swings and price may crisscross the ribbon frequently. -The scalper then watches for realignment, with ribbons turning higher or lower and spreading out, showing more space between each line. This tiny pattern triggers the buy or sell short signal. How do you know when to take profits or cut losses? -The best ribbon trades set up when Stochastics turn higher from the oversold level or lower from the overbought level. Likewise, an immediate exit is required when the indicator crosses and rolls against your position after a profitable thrust. Time that exit more precisely by watching band interaction with price. Take profit into band penetrations because they predict the trend will slow or reverse; scalping strategies can’t afford to stick around through retracements of any sort. Also take a timely exit if a price thrust fails to reach the band but Stochastics rolls over, which tells you to get out. Don’t you like this strategy? Or do you want to know more about how the forex scalpers scalp?